Poor John Nichols, fifty-seven, has a lot on his plate. Father to (2) grown daughters and a nineteen year-old developmentally challenged son who often behaves like a 3 year-old, John's also divorced from Mary, a woman he still loves -- she kicked him out after he cheated on her. "Note: I wasn't a full-fledged philanderer. In more than thirty years of marriage, I only stepped out with one woman, lovely Rita, and it didn't last long. Then I came to my senses, confessed all, begged forgiveness, had a bar of soap thrown at my head, had a bar of soap hit me in the head, and was told to move out. Nine months later I was a divorced fifty-five year old man, living alone, trying to decide whether to have Dominos for lunch, and mac and cheese for dinner, or mac and cheese for lunch and Dominos for dinner." The story begins with John and son Ethan traveling by van from Illinois to South Carolina for daughter Karen's wedding. John decided to take the car route with Ethan as last time they traveled by plane Ethan had a meltdown and the results were disastrous. This trip proves challenging as well, as along the way Ethan tests his father's patience and the trip takes much longer than planned. When the family eventually hooks up both Karen and John have unexpected news to share with the family that shocks the other family members. This was such a sweet story. The author does an amazing job for capturing what life might be life for parents with children developmental challenges. 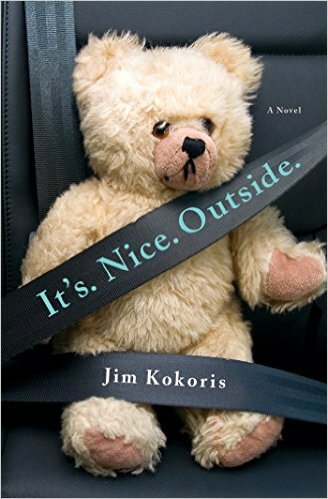 Readers who love heartfelt stories and reading about quirky characters and dysfunctional families should give this one a try. I was so happy I tried this one. I definitely plan to read other books by this author - this was my kind of story for sure. I hunk I might give this a go because the writing seems quite witty, which I like. I really do find the cover off-putting though - is that bad? Hi Emma, I agree the cover is unusual, but it shouldn't alarm you - it's a bear in a seat belt which accompanied the father and son on the road trip. This sounds rather sweet. I'm curious about the surprising news. I like the sound of the story, I'll see if my library has it. The cover is a bit strange. My library won't have it yet since it's not released, but I'm going to put in a purchase suggestion for it. They seem to always get books that are suggested to them, which I love. The story sounds very realistic and I do hope the ending is positive. The title sure is catchy. Thanks for sharing. It's not a depressing ending. Dang, that does sound might good! I like the sound of this one as well as the writing style. I'll be on the lookout for this novel! I Loved the writing style. I am going to put this on my "look for it" list. Thanks for the review, it changed my mind. I think you'd enjoy it Judy. I just got approved to get this ARC. I'm glad I asked for it, since it sounds like a winner. Thanks! I'll put this on my list of books with autistic characters. I can only read them every so often but this one looks really good.